Review copy sent to me by the author, upon my request. Also, I’ve met him a couple of times and I think he’s fantastic. Content: There’s no swearing, and only hints at romance. It’s in the middle grade section (grades 3-5) at the bookstore, though older kids would like the con aspects of it, I think. Jackson Greene is going clean. He got ratted out (and caught) four months ago, in what he calls the “Kelsey Job” but what the school has come to know as the “Mid-Day PDA”. It cost him a certain amount of freedom (he can no longer have a cell phone, and he has weekly meetings with the principal, Dr. Kelsey) and one of his best friends, Gaby de la Cruz. Fast-forward to the fall of 8th grade, and student elections. Gaby’s running for president, and Jackson’s not going to get involved. That is until her opponent suddenly drops out, and Jackson’s nemesis, Keith Sinclair, enters the race. Jackson knows something fishy is up, and sets out to prove it. Of course, that means a long con. Which means he needs a crew. Jackson assembles a memorable one: reminiscent of great heist movies (Oceans 11 is referenced more than once) and books (Heist Society! ), Johnson weaves in not only every stereotypical element (there’s the right-hand-man, the tech guy, the runner, the money) but also plays against stereotype. My favorite is with the beautiful cheerleader Megan Feldman, who is a tech and programming genius. 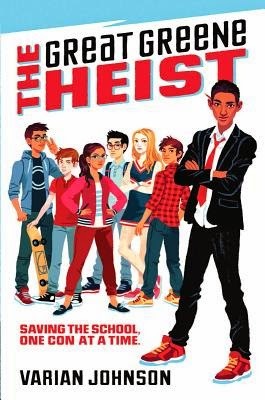 But there’s also Hashemi who is a budding inventor (my favorite: the MAPE, a beta cellphone the size of a brick); Bradley, a sixth-grade artist who’s mostly in awe of being included; Victor, the money behind the operation; and Charlie, twin brother to Gaby, and Jackson’s right-hand-man. And the cool thing? Only two of the crew is white. It was refreshing that race rarely comes into play; for the most part characters were just that, and not the “Asian kid” or the “Black kid” or the “White girl”. Yes, one of the older secretaries is subtly racist, mixing up the names of the Asian kids and saying “Boys like you are always up to something or other.” It’s probably over-the-top, but in the context, it works. And the principle is a certified jerk (he was the one I wondered about: how did he ever get to be in charge of a school and not challenged?). But then again, this is all an elaborate fantasy: how many 13-year-old boys are capable of running a long con? It was a ton of fun, though.